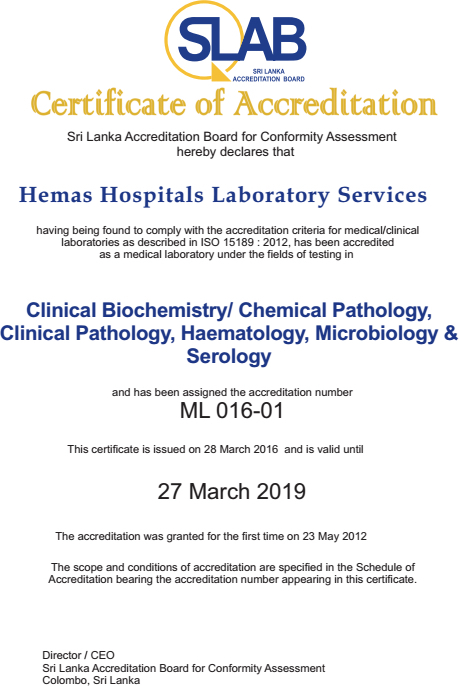 Hemas Hospital Laboratory Services, an integral part of Hemas Hospitals, is accredited with ISO 15189 and ISO 9001 standards. We provide the best clinical outcomes in the medical sector by adopting strong clinical standards and supported by passionate, well-trained, committed and motivated staff. This division, established in 2008, is now the fastest growing Laboratory chain in Sri Lanka and most respected diagnostic service provider in the country with a network of 36 laboratories, owned and operated by Hemas Hospitals Laboratory Services & 07 Joint ventures. We also operate over 570 franchised centres all around the country. 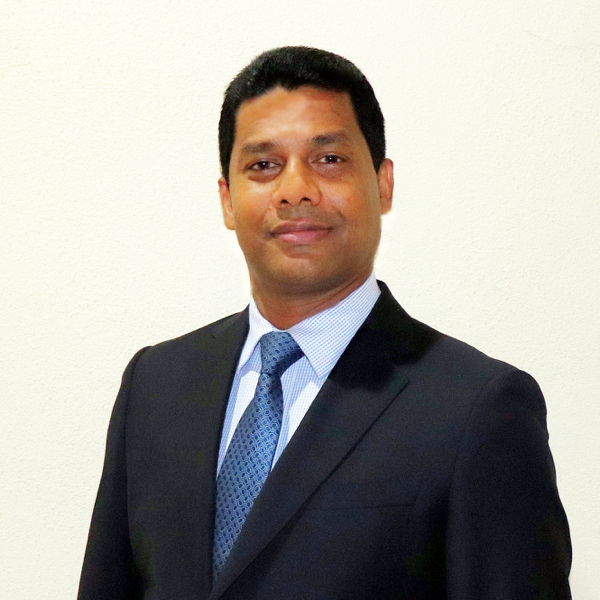 Hemas has the largest company owned laboratory network in Sri Lanka. It has a proven track record for strict adherence to international standards and benchmarks. 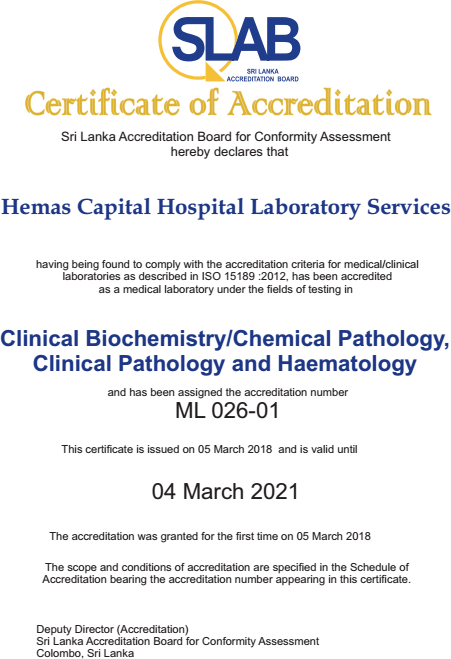 Hemas Hospitals Laboratory Service offers the widest test menu and has presence in all important cities and towns of Sri Lanka in the form of state-of-the-art laboratories and patient service centres. We serve over 5 million customers every year. To lead in provision of Medical Laboratory services with state of the art technology and international standards in order to meet the ever changing demands, satisfying all our customers with best quality and most reliable Test Reports and Services in Sri Lanka spurred by an empowered set of dedicated individuals who are driven by an irrepressible desire to work as one towards a common goal in the truest sense of the team spirit in order to meet our Vision. To be recognised as the most accurate clinical laboratory chain in Sri Lanka, by setting up international standards while becoming the trend setter in the industry. The American Association for Clinical Chemistry (AACC) is a global scientific and medical professional organization dedicated to clinical laboratory science and its application to healthcare. 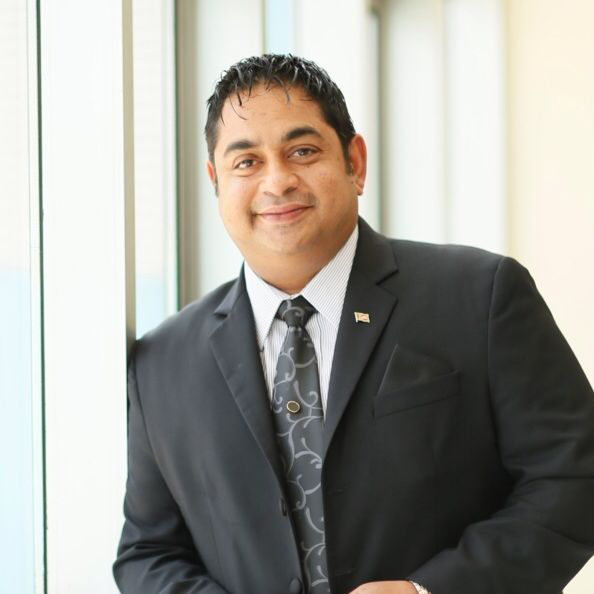 Its leadership in education, advocacy and collaboration helps lab professionals adapt to change and do what they do best: provide vital insight and guidance so patients get the care they need. The International Federation of Clinical Chemistry and Laboratory Medicine (IFCC) is a worldwide, non-political organization for clinical chemistry and laboratory medicine. As such it has a range of roles that include (1) global standard setting in collaboration with other international organizations, (2) supporting its members through scientific and educational endeavor, and (3) providing a series of congresses, conferences and focused meetings in order for laboratory medicine specialists to meet and present original findings and best practice. The accreditation scheme for Medical/Clinical laboratories is based on ISO 15189:2012 Medical laboratories – Particular requirements for quality and competence. Areas covered under this scheme include Clinical Pathology, Clinical Biochemistry, Haematology, Microbiology and Serology and Immunology. Reliability and accuracy of test results issued by Medical/Clinical laboratories is a critical issue in National Healthcare System. 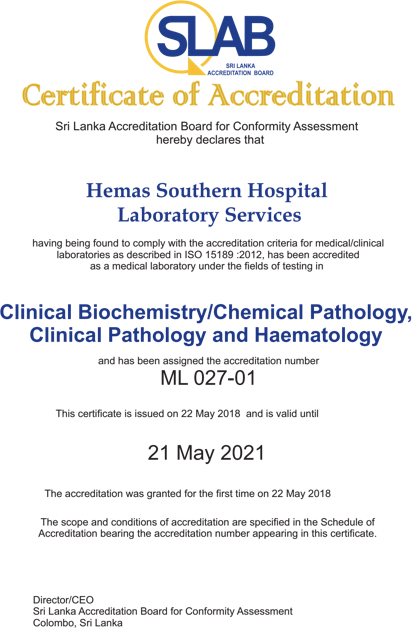 Reliability of test results is assured through accreditation of Medical laboratories based on ISO 15189: 2012.Hemas Wattala and Thalawathugoda hospital labs are accredited with ISO 15189:2012.